Similar to Super Mario Galaxy, where players took control of a star and could float around Mario and assist him, the co-op for Super Mario Odyssey allows a second player to join in at any time and control Mario's hat, Cappy. The co-op demo that Nintendo held on their stage yesterday starts around the 4:00 mark in the video below and then wraps up around the 13:00 mark. While controlling Cappy, the second player is able to fly around independently from Mario, which they show off by solving a puzzle involving collecting music notes. 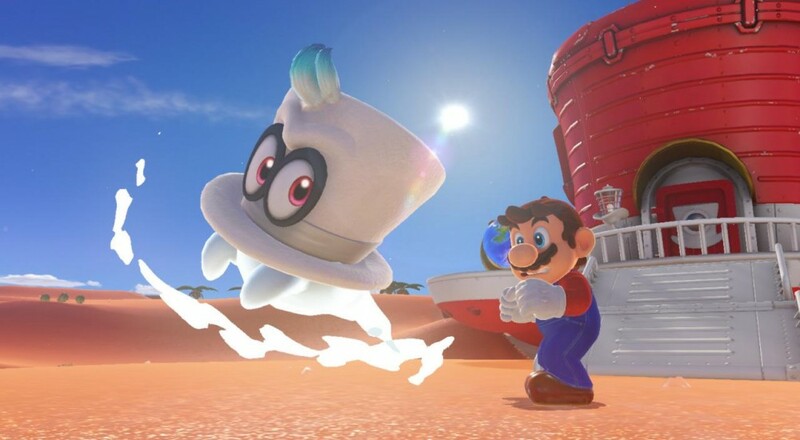 Cappy is also invincible and can attack enemies for Mario to keep him out of danger. While it's easy to dismiss this as "little brother" co-op, these kinds of modes are useful for introducing new players to games by giving them some control/agency without the fear of consequences. They also mention that Mario would still be able to toss his cap, presumably, in order to posses something by using a special move, which they don't show off. It's unclear if the second player gets kicked out of the game while Mario is possessing things. Super Mario Odyssey will be arriving on October 27, 2017 for the Nintendo Switch.